Our primitive ancestors may have been onto something with their hunter-gatherer culinary practices, and the Paleo diet has lately been making headlines in support of this revelation. From savory dishes to Paleo crackers, the Paleo recipe roster has found a well-earned place in the push for a healthier, happier palette. Often called the Caveman or Stone Age diet, the Paleo philosophy aligns itself with the principles of the Paleolithic way of life. No, not clubbing romantic partners over the head and spearing wooly mammoths, but leading a naturally active lifestyle combined with the consumption of lean, healthy fats, nuts, fruits, and minimal grains, legumes, and dairy items. The Paleo plan is founded on the premise of consuming only organic, whole foods–with only the slight exception for select bottled or prepackaged ingredients and condiments–thus eliminating harmful preservatives, additives, sugars, sodium, and artificial flavorings from your diet. The result? An elimination of toxins and synthetic chemicals, and a major boost in nutrients and overall quality of food, with the added benefit of some seriously delicious fare. Weight loss, mental clarity, increased energy, improved sleep, reduced allergies, skin and hair vitality, higher immunity, and lowered risk of cancer and heart disease are just a few of the benefits of opting for Paleo food. A common misconception about the Paleo diet is that what you gain in nutrition you lose in taste and menu options, neither of which are true! 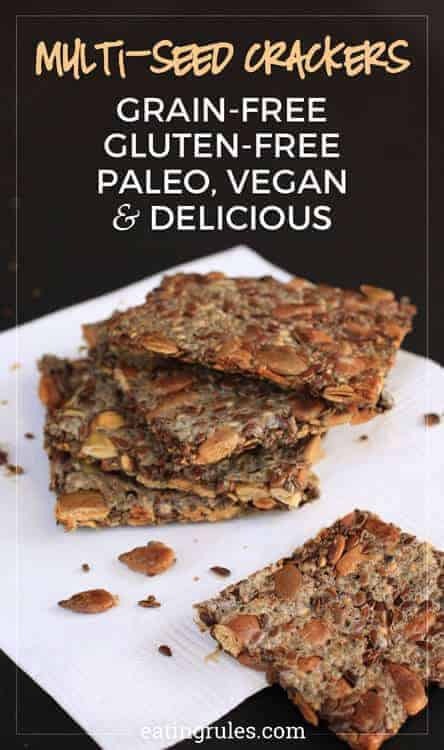 The Paleo kitchen is rich with possibilities for preparing awesome-tasting snacks and meals. 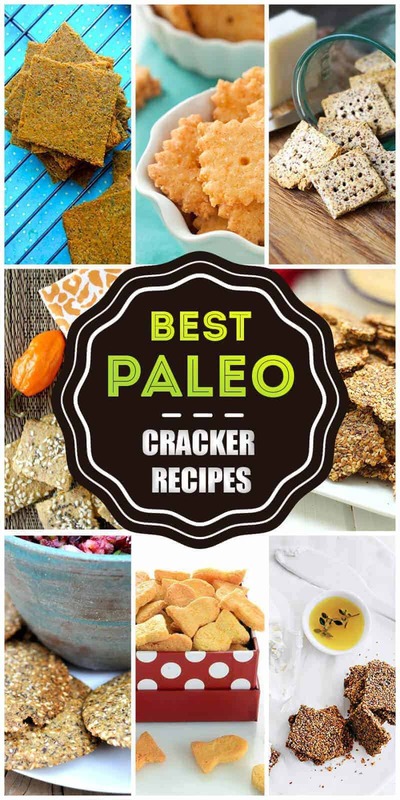 Below are 50 Paleo cracker recipes sure to tantalize your tummy, and maybe even turn a few naysayers. Three simple ingredients are all that’s needed for this tasty, good-for-everything cracker. 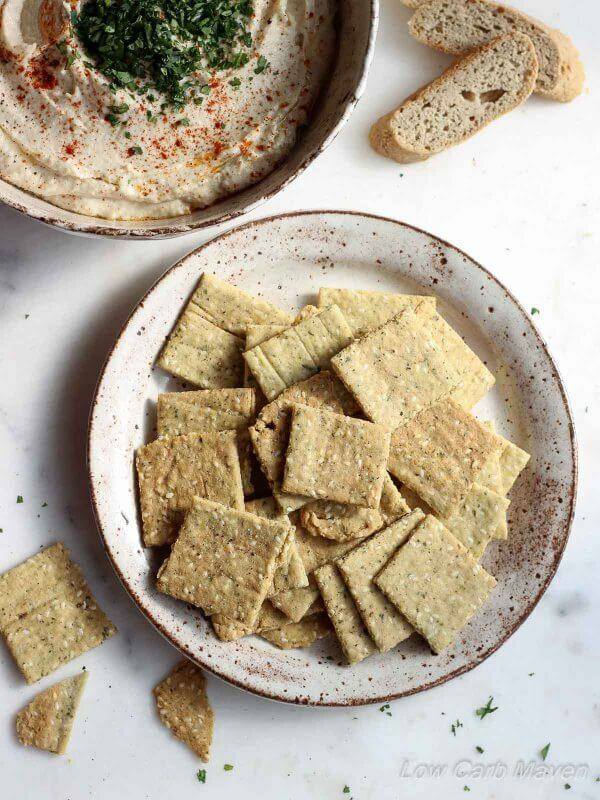 Perfect for Paleo dieters and the gluten-sensitive alike, these crunchy crackers have just the right amount of salt to compliment anything from hummus dips to savory toppings, and are equally great just by themselves. You can even get a little creative by making your own varieties, such as cheese, garlic, pesto, and sundried tomato. The Paleo diet prides itself on minimizing grains, and for those who follow a strict Ketogenic regimen it can feel next to impossible to satisfy crunchy cravings. 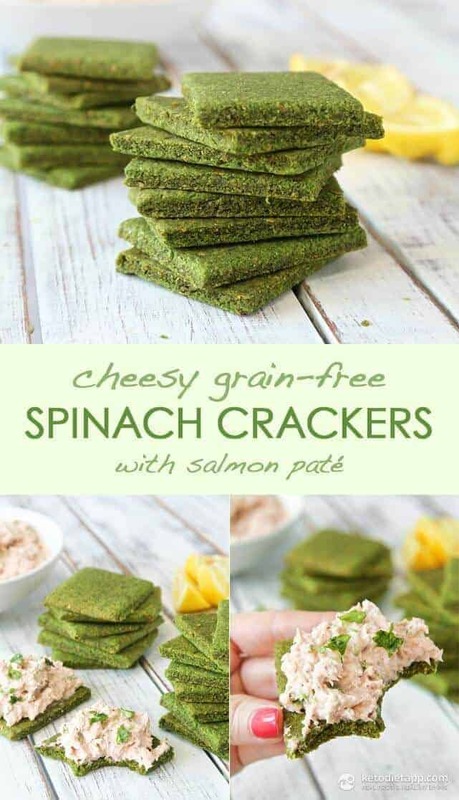 This easy recipe is not only grain-free and gluten-free, but yields super satisfying crackers to snack on, especially when paired with smoked salmon, avocado, and cream cheese. Nostalgic for a childhood breakfast treat? 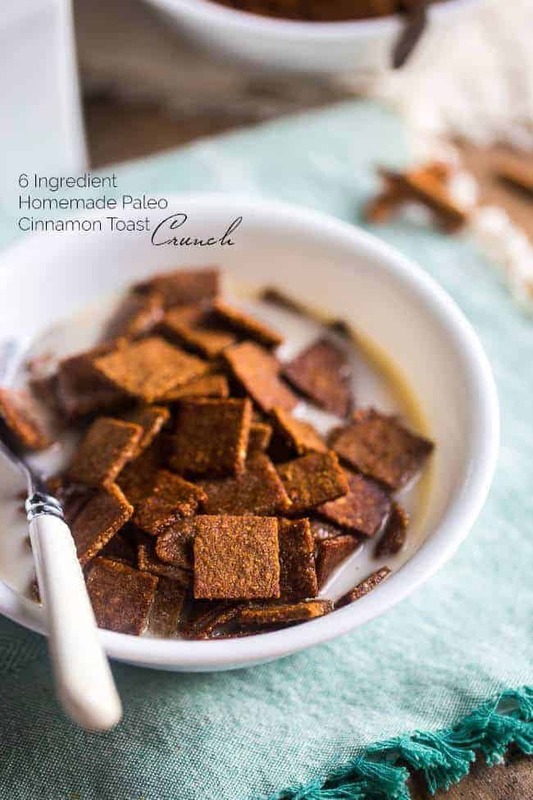 This Cinnamon Toast Crunch recipe not only tastes exactly like the real thing, but is gluten-free, grain-free, and dairy-free, with none of the refined sugars that sent you bouncing off the walls as a kid. 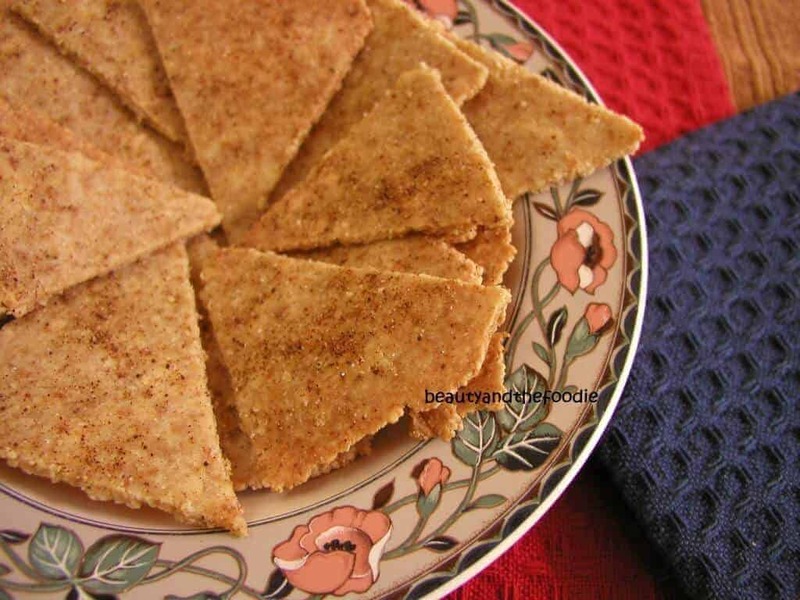 Perfect in a bowl of almond or coconut milk or snacked on right out of the oven, these cinnamon crackers are also great for incorporating into Paleo desserts. 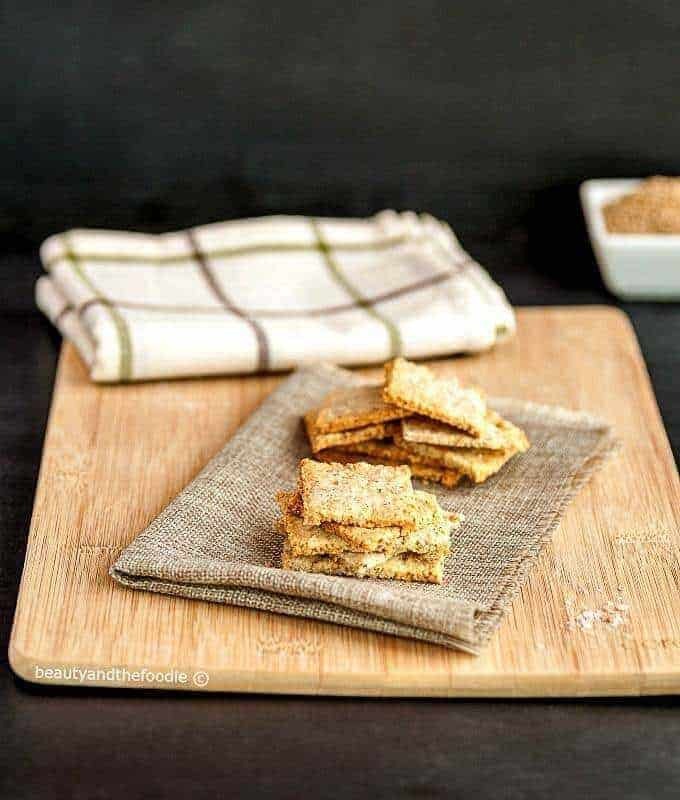 Another much-loved childhood staple, these almond flour Paleo graham crackers may be gluten-free and grain-free but definitely don’t skim on the yum factor. Head to the kitchen and whip up a batch to keep on hand for those sweet tooth surges, and enjoy with almond butter spread or dunked in a glass of dairy-free milk. 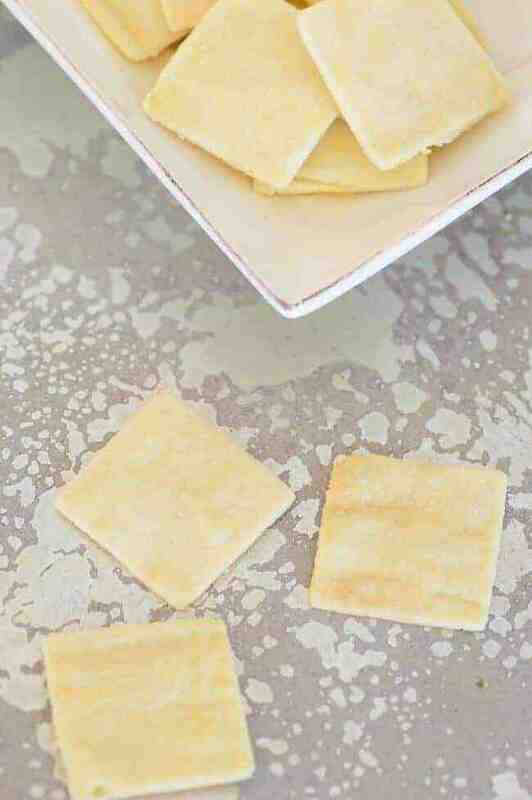 Crunchy, buttery, and perfect for those wine-and-cheese happenings, this simple 3-ingredient cracker keeps it classy and delicious. Made for pates, nut and cheese spreads, or served alongside appetizers, think of them as sturdier versions of Wheat Thins or Ritz crackers. The Paleo plan may frown on Goldfish and Cheez-its, but that doesn’t mean you can’t indulge every now and then–and best of all, without breaking the rules. These Paleo-approved cheese crackers are not only grain-free and gluten-free, but pack the perfect cheddary punch with just a pinch of cayenne for added grown-up zing. This Mediterranean-inspired Paleo recipe is so flavorful you probably won’t need any add-on toppings. The combination of rosemary, thyme, sesame, olive oil, and Himalayan salt make for a ridiculously good summer snack food you can dip into all year round. 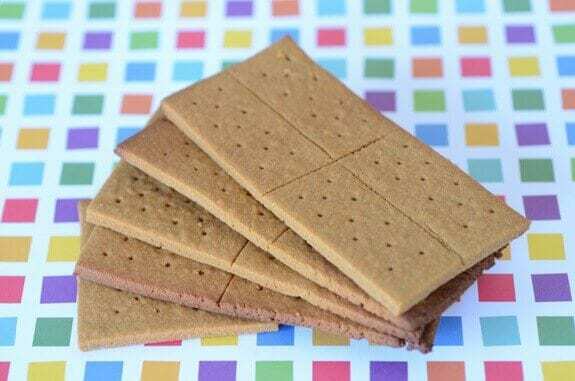 Another version of the tasty childhood throwback, these gluten-free, grain-free, and nut-free graham crackers can be made with or without the coconut sugar, and are perfect for Paleo-friendly desert combinations. Just as the name suggests, these crackers are packed with fiber-rich, omega-filled goodness that will keep you going all day, while keeping your tummy equally happy. 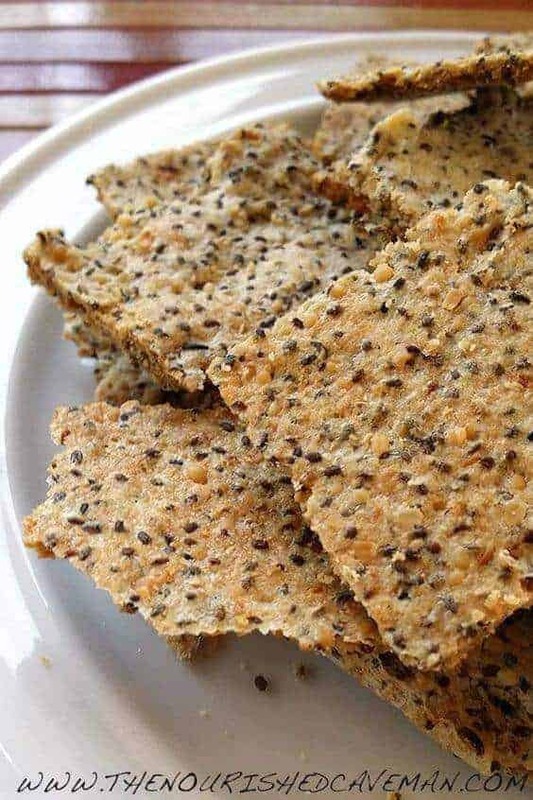 Flax, sesame, poppy, and sunflower seeds make this a great snack to carry in your bag when you need a little energy boost while satisfying hunger pangs. A touch of honey gives these crackers just the right amount of sweetness to make them a perfect alternative to the usual go-to cookies we often employ to zap our cravings. Sunflower seeds add a nice crunch, while the grain-free quotient means zero guilt for you! Delicious topped with dairy-free yogurts and fruit spreads or served with herbal teas, these crackers are a great basic to keep around when your sweet tooth beckons. Arguably one of the best parts of restaurant dining, Italian-loving Paleo food followers need not mourn the loss of this tabletop favorite. 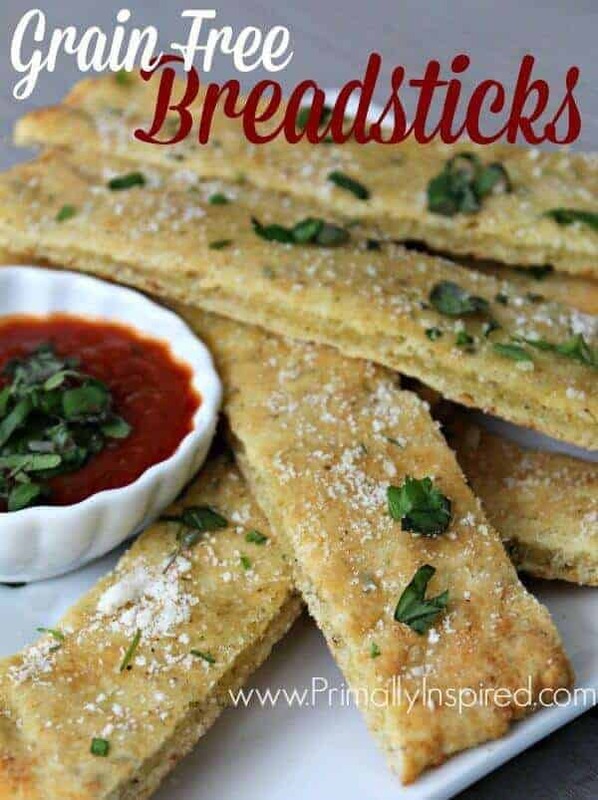 These insanely good grain-free breadsticks almost don’t count as a substitute for the real thing, they just might be better. 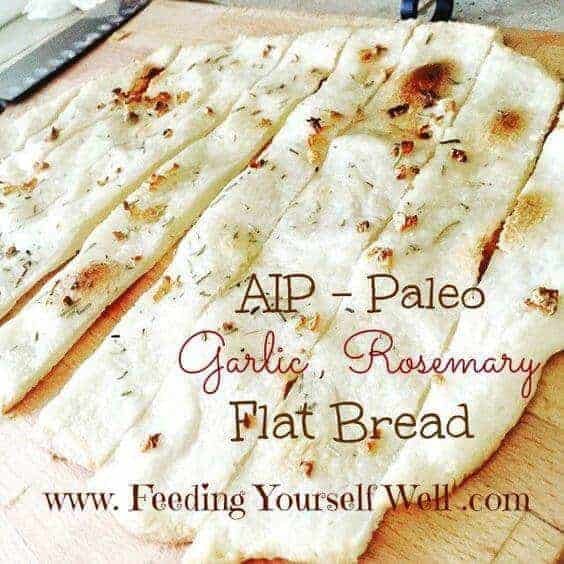 A variety of garlic and traditional herbal seasonings, combined with sea salt and optional dairy-free Romano or Parmesan, are sure to make these Paleo breadsticks a new tradition in your culinary repertoire. These grain-free chips are a great alternative to store bought (and Paleo no-no) tortilla chips. Low carb and gluten-free, these cracker-like chips are slightly seasoned with cumin and chili powder, making them ideal for dipping in homemade salsas, sauces, chili stews, or solo munching. Italian herbs and spices can also be used as a variety, especially when paired with tomato marinara dips. 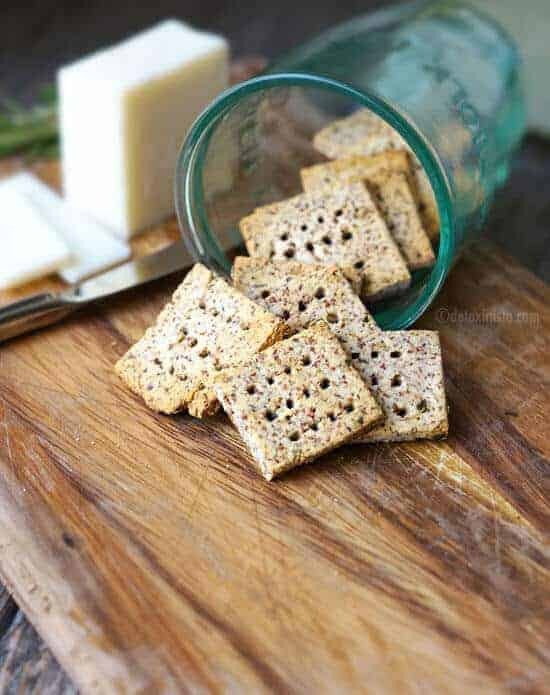 These Keto-friendly, grain-free and gluten-free crackers have just the right amount of nutty cheese flavor, with a trio of Parmesan, Cheddar, and Jack, to make them a tastier adult version of the usual cheesy snacks. Great for pairing with veggie dips or crumbling over salads for a little extra crunch. You’ve probably heard the much-touted benefits of spinach all your life: high in niacin, zinc, protein, fiber, vitamins A, C, E and K, thiamin, vitamin B6, folate, calcium, iron, magnesium, phosphorus, potassium, copper–the list goes on and on. Throw in flaky chili pepper, Parmesan, and a dash of Himalayan salt, and eating your spinach has never tasted so good. 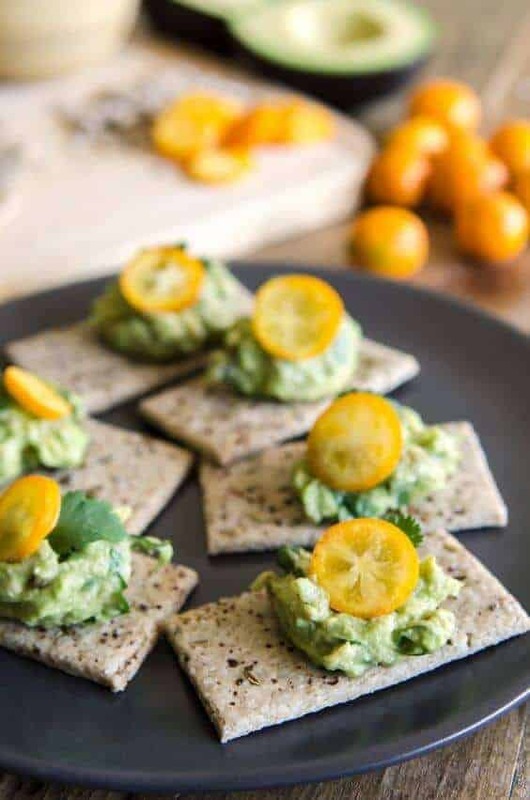 This colorful green crackers are great alone or paired with homemade dips, soups, and savory toppings. Either way, you’ll never turn up your nose at eating your veggies again. 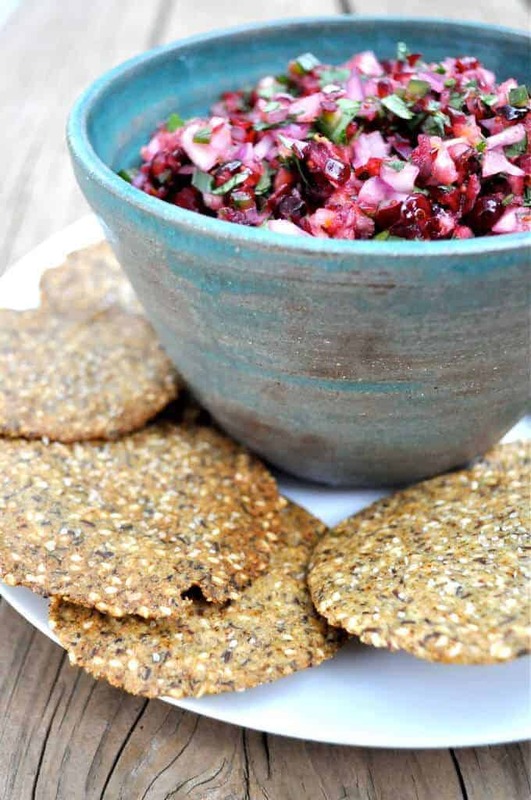 With their combination of fiber-packed flax, pumpkin, chia, and sunflower seeds, these hearty, zero-grain crackers are practically micro-meals. Furthermore, optional black pepper, chili, onion, garlic, oregano, and rosemary seasonings make them a more than a little addictive snack option for keeping your mojo working throughout the day. Call this an everything-bagel in a cracker: these grain-free Paleo crackers literally go with anything, from dairy-free cream cheese spreads and organic preserves to a variety of homemade savory toppings. And like their bagel counterpart, they’re equally as tasty on their own. These grain and nut-free, 100% seed crackers are made from 4 different seeds–flax, pumpkin, sesame, and chia–and that’s it! With added water, salt, and optional seasoning for taste, they’re truly an all-around brilliant Paleo staple to keep in the kitchen for any occasion or snack idea. Who says the Paleo diet doesn’t include the holidays? This Paleo recipe for festive cranberry salsa paired with homemade chips is sure to be a hit at seasonal gatherings, with a treasure trove of naturally sweet, salty, and zesty flavors sure to please even the pickiest taste buds. Cranberries pack a potent punch of vitamins C, E, and K; combined with the sesame, flax, and pumpkin seed fiber from the chips and you’ll be keeping on your healthier side while snacking through the holidays. Loaded with protein, fiber, and Omega 3, this easy recipe is great for all Paleo snack options. 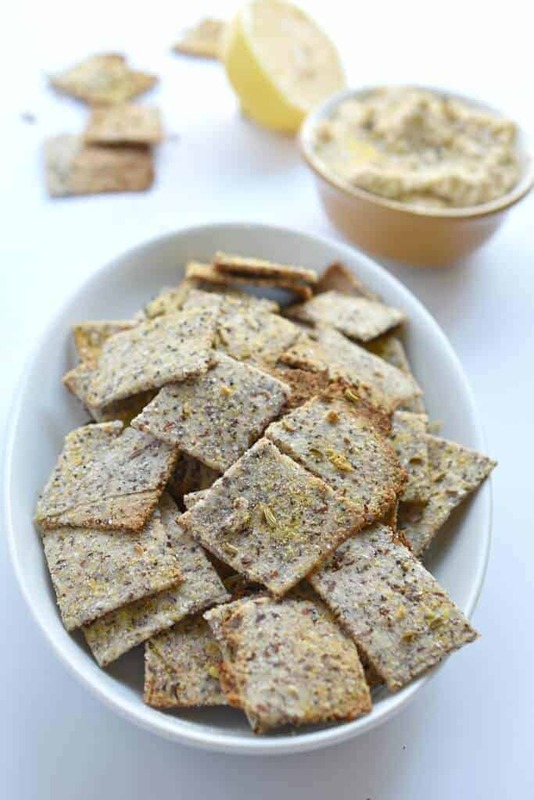 Herbs de province and turmeric keep things flavorful, while the no-grain ingredients make these crackers a great gluten-free option. Awesome on their own or garnished with an assortment of veggies or homemade spreads. 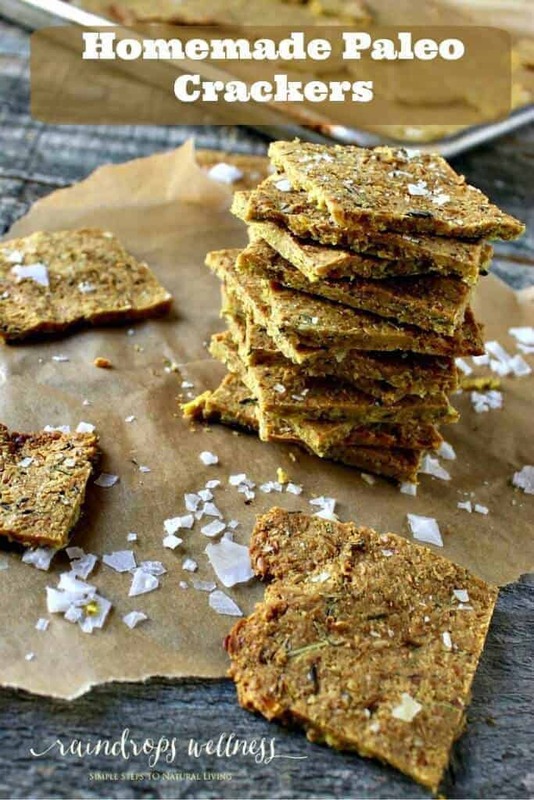 They may not take the place of onion rings, but these Paleo onion crackers are pretty close. Seasoned with garlic, onion, and provincial herbs, these grain-free treats are a fantastic substitute for guilty fast food pleasures, with zilch in the way of guilt. Perfect for snacking on as they are, or combined with savory French onion soups and stews. 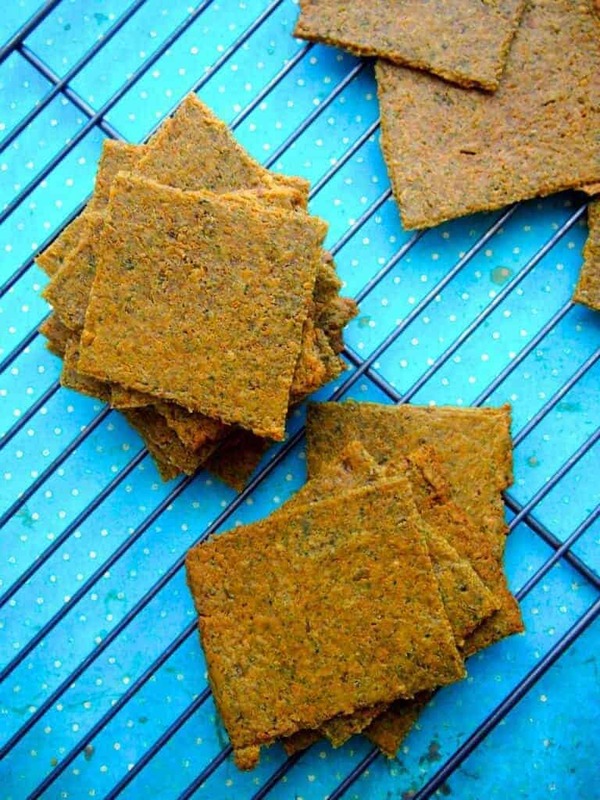 Vegetable crackers may seem like a hard sell, but of all the Paleo cracker recipes out there this one is definitely a winner. Leftover green juicing pulp can finally be put to good use; just mix in a little onion and garlic powder and you’ve got a surprisingly scrumptious–and healthy–snack. Perfect for guacamole and hummus dips, these crackers can even be paired with your favorite soups and salads for added flavor and texture. 3 is definitely the magic number in the Paleo kitchen, and these almond crackers are as easy to make as they are delicious. Almonds are loaded with lots of healthy fats, protein, fiber, magnesium and vitamin E, so it’s no wonder almond flour is a frequent go-to for gluten-free and Paleo cracker recipes. Rich, buttery, and 100% grain-free, they’re perfect on their own or piled high with your favorite dips and spreads. Missing your Wheat Thins? Well weep no more, because these simple almond thins are stiff competition for the boxed store-bought brands. 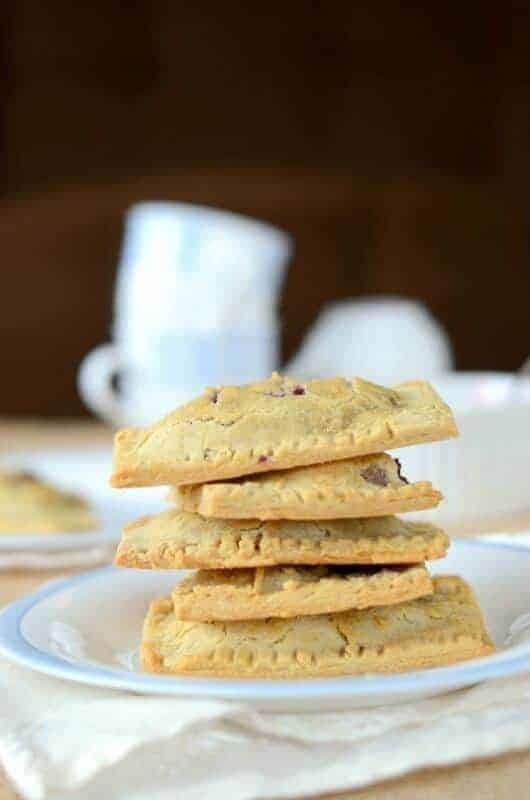 Made from healthy almond flour and seasoned with onion, garlic, and salt, they’re impossible to stop snacking on, and so easy to make no rationing of portions is necessary. 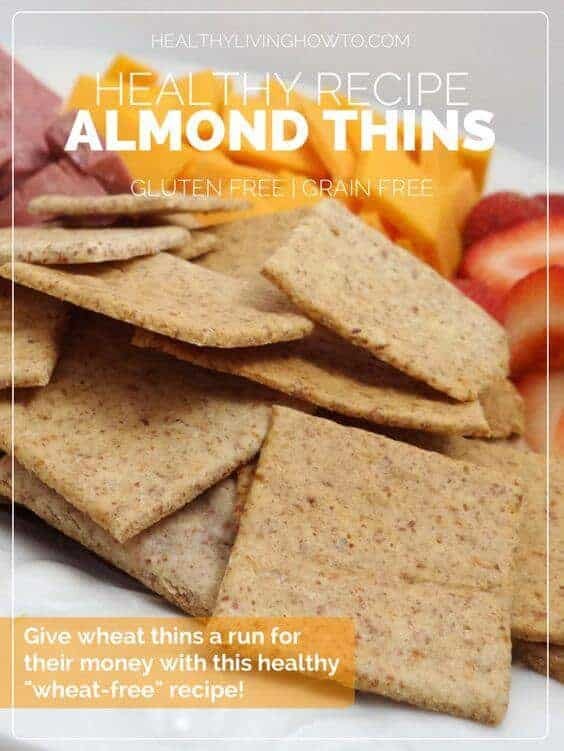 These almond “wheat” thins are perfect for spreading with veggie and cream cheese dips, almond butter, or sweeter jams and marmalades. 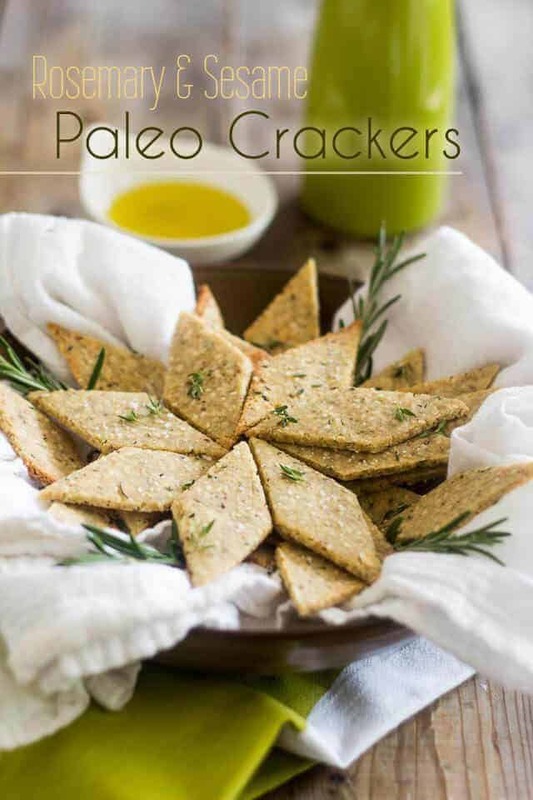 In the absence of artificial seasonings and additives, you may have guessed that herbs abound in Paleo cracker recipes. 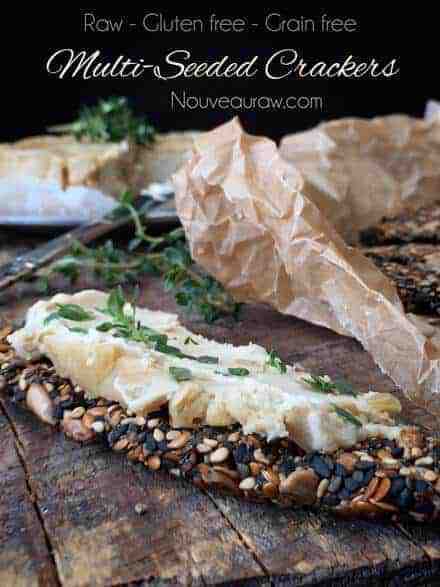 These herb crackers are no exception, with a welcome invitation to play around with your own favorite seasonings when preparing them. Pizza, rosemary, sundried tomato, taco, and garlic are just a few of the flavor combinations you can create while sticking to the Paleo guidelines. You probably thought there was a no-cheese clause in the Paleo diet, didn’t you? Well this easy recipe is yet another tantalizing contradiction. This grain, dairy, and nut-free cracker also contains zero cheese, but we’d challenge anyone to notice. Sunflower, pumpkin and sesame seeds, combined with coconut oil and a pinch of salt, cleverly give the illusion of all those bad-for-you cheesy snacks with only good-for-you ingredients. If you make your own almond milk, you’re probably at a loss as to what to do with all that yummy, nutrient-rich almond pulp. 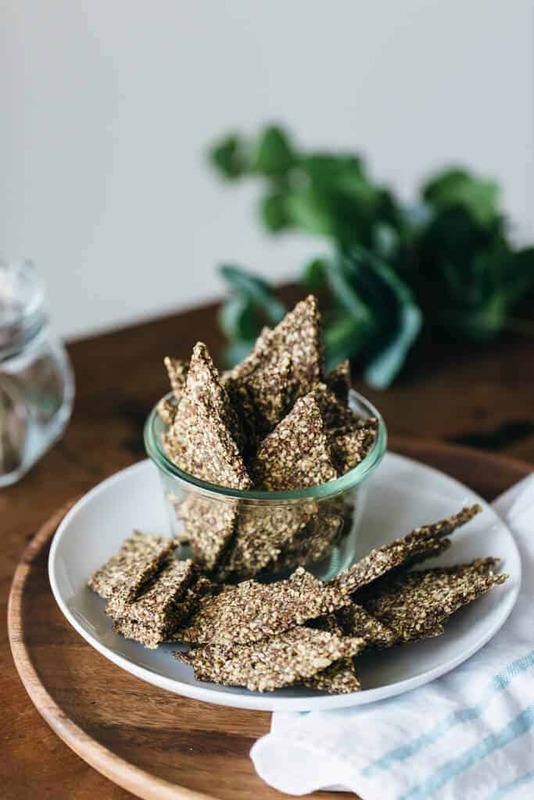 Like the previously mentioned veggie cracker that cleverly employs leftover green juice pulp, this easy Paleo cracker recipe is perfect for leftover almond milk pulp. Vegan and and 100% gluten free, these crackers are the perfect snack for teatime, coffee breaks, and all around nibbling. 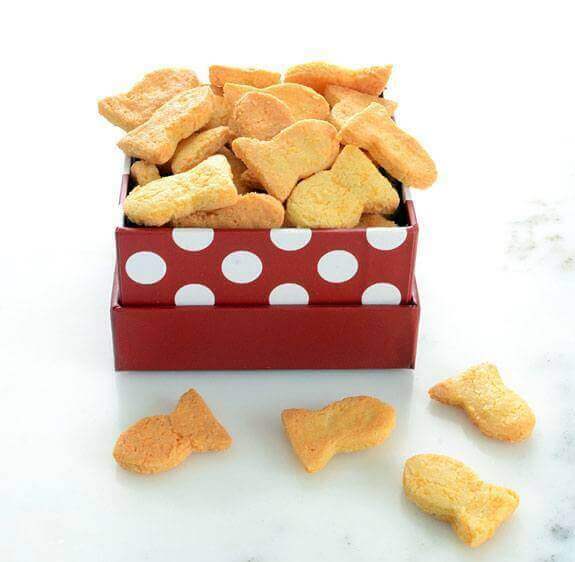 You read it right: Paleo Goldfish. 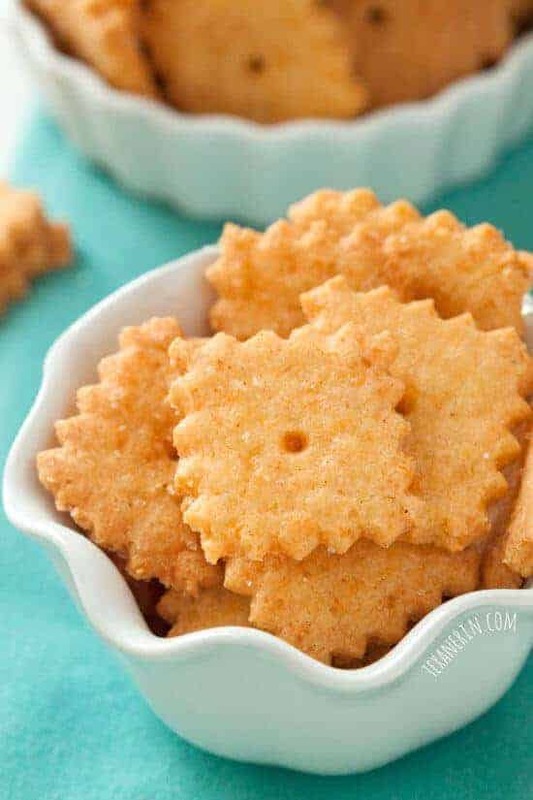 These fun grain-free crackers have all the cheddary taste of store bought Goldfish without the laundry list of unpronounceable ingredients. Great for kids and picky eaters, or indulging your own inner child, these low carb treats are proof that there really is a mouth-watering Paleo alternative to just about anything. And with just six simple ingredients–almond flour, salt, baking soda, cheddar cheese, olive oil, and egg–they make for a perfect gluten-free snack. With more and more gluten-free options available, it’s no wonder this Paleo recipe is a go-to favorite. 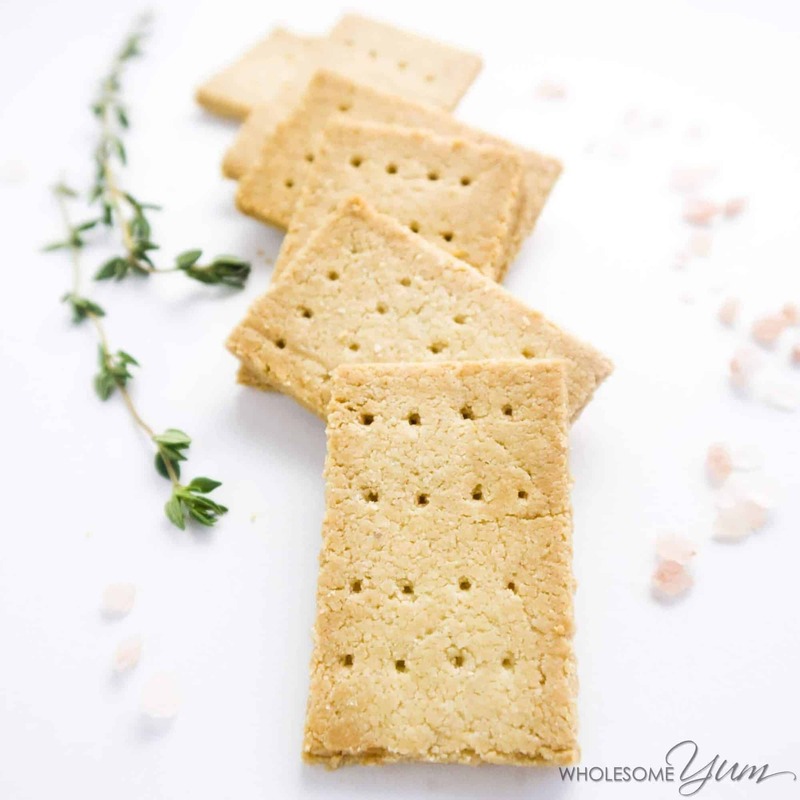 These almond flour graham crackers have all the familiar sweetness you’ve loved since childhood, but without the troublesome grains and preservatives. 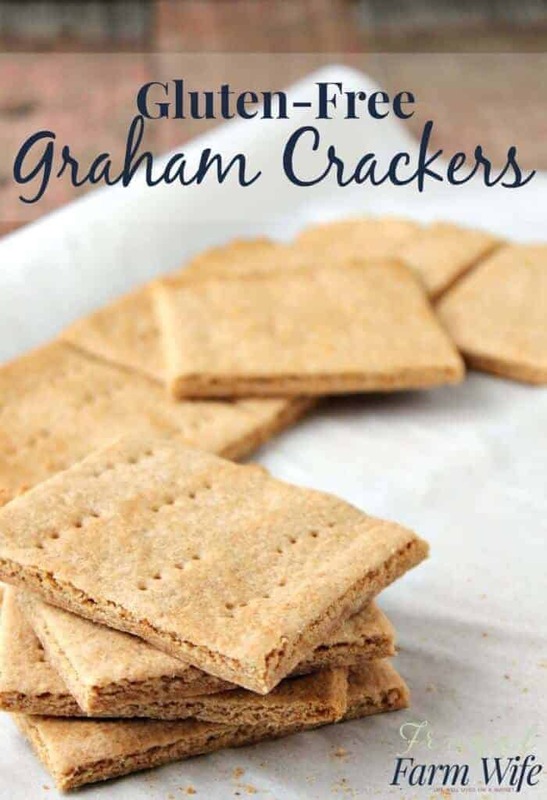 Perfect for homemade s’mores and dessert recipes, these crackers are great to keep on hand when your sweet tooth cravings get the best of you. 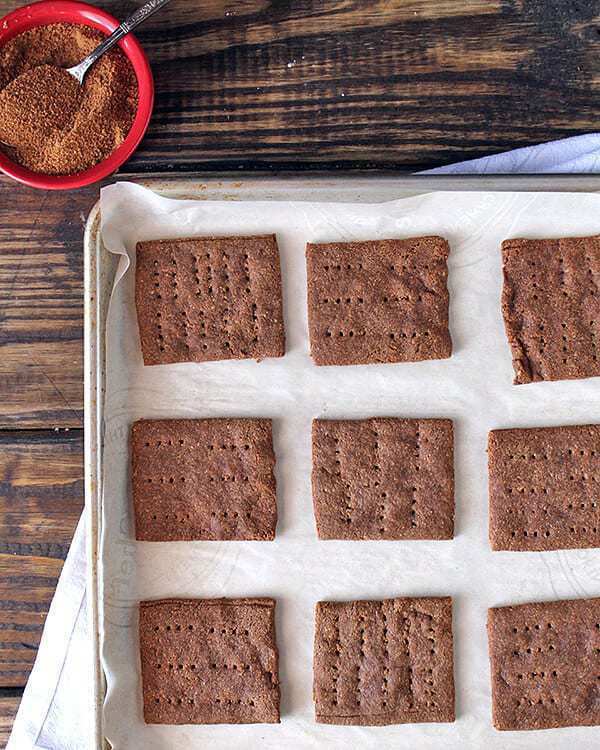 These Paleo-approved and gluten-free graham crackers are easy to make and great for dunking into coffee or almond milk. Yacon syrup brilliantly lends this recipe a unique likeness to the traditional graham cracker flavor, while almond flour keeps it on the grain-free side of snack foods. Definitely a Paleo recipe worth filing away! This vegan-friendly Paleo recipe allows a lot of elbow room for substituting certain ingredients according to your tastes and preferences. Great as a staple at mealtimes, these versatile crackers can be plated with dips and veggies, piled up next to chicken and vegetable soups, or snacked on by themselves. For those with vegan concerns, honey can be easily substituted with agave nectar, with additional spice and seasoning options open for personal interpretation. These buttery Paleo, vegan, and gluten-free pita crisps are almost too good to be true. 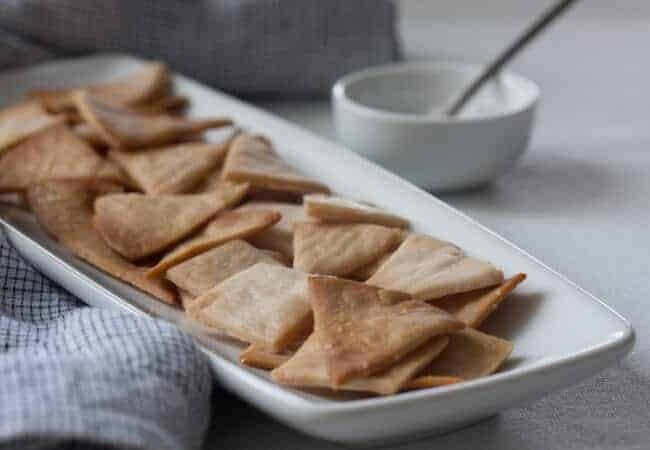 Consisting of simple ingredients you likely already have on hand in your cupboard, these pita crisps are delicious on their own or accompanying your favorite Eastern dishes, spreads, and dips. Best of all they’ll keep for an exceptionally long time in the freezer, so any excessive batches can easily be saved for later indulging. Cassava has long been a dietary staple in South America, as well as regions of Asia and Africa. 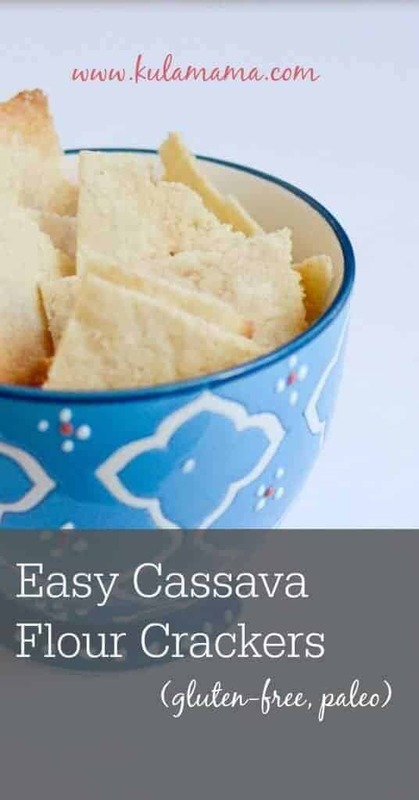 Also referred to as yuca or manioc, the cassava root has since been embraced by modern kitchens as a suitable Paleo and gluten-free ingredient option. 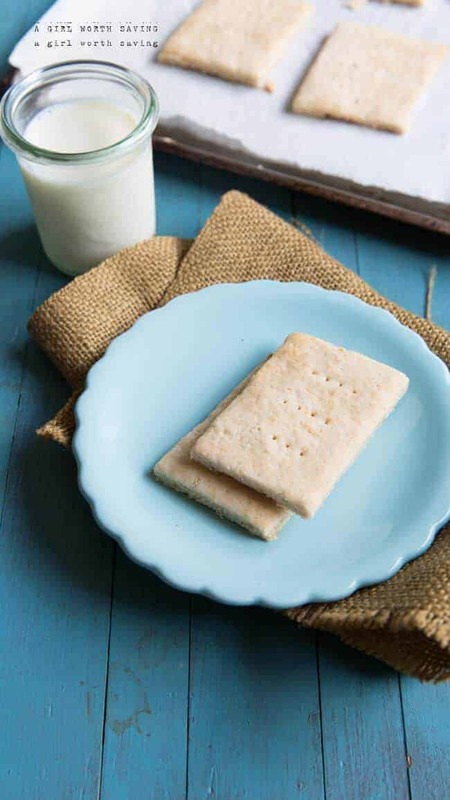 These lightly sweetened crackers are simple to make and a delectable alternative to snack time cookies. Spread with your favorite almond or cashew butter, organic marmalade, or Paleo-friendly nutella for the ultimate afternoon treat. Commercial Pop Tarts as we know them probably top the list of discouraged snack foods across every nutrition and dietary board. Loaded with simple sugars, carbohydrates, additives, and preservatives, these oh-so-good but oh-so-bad-for-you treats finally got the healthy do-over they deserved with this delicious and easy recipe. These “pop” tarts are more in line with upscale bakery pastries, utilizing cassava flour and maple syrup in place of artificial starches and sweeteners. Fill with your own favorite organic marmalade or berry preserves, and serve with a cup of coffee or tall glass of milk. Rosemary is definitely a favorite in Paleo cracker recipes. Generally used in savory chicken, lamb, pork, and seafood dishes, it’s long been used to flavor breads and other baked goods as well. These cashew and almond-based crackers are a tasty way to up your nut-derived fiber and Omega 3 intake without sacrificing your snack food standards. 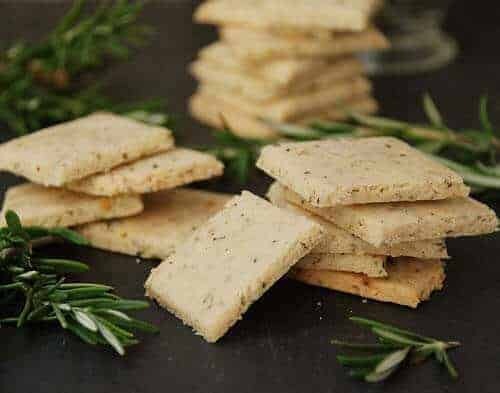 Generously seasoned with rosemary and garlic, these crackers are definitely on the must-make Paleo cracker recipe list. 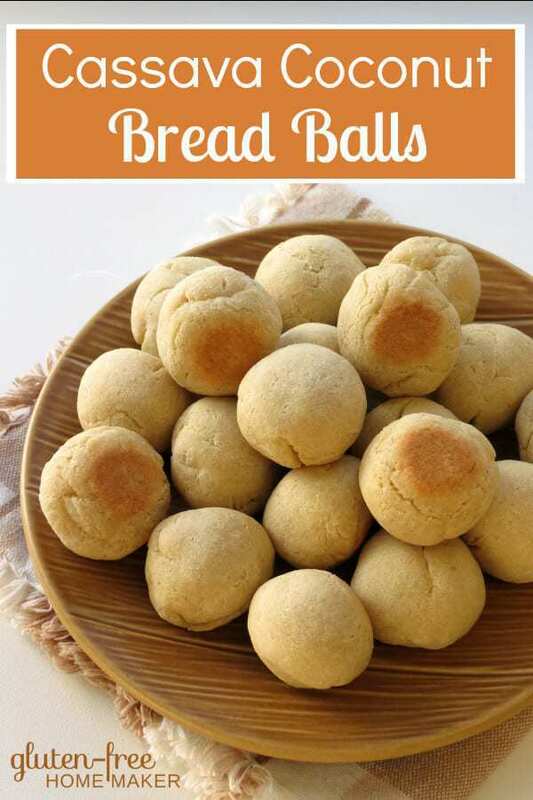 Yet another amazing use for cassava flour in the Paleo food world, these coconut bread balls are great in place of traditional bread basket items like dinner rolls, and are equally delicious in stews and sauces a’la matzo ball style. For an Italian twist mix garlic powder in with the ingredients, dust the bread balls with organic or dairy-free parmesan, and serve alongside a bowl of homemade tomato sauce for a fabulous pizza alternative. Tigernut flour is a relative newcomer on the whole food scene, but quickly gaining popularity in gluten-free and Paleo kitchens. Derived from a root that is native to the regions of the Mediterranean and North Africa, tigernut is incredibly high in fiber, protein, iron, magnesium, potassium, zinc, and vitamins E and C, making it a powerhouse of a flour base for all your favorite goodies. These graham crackers have all the honey-vanilla sweetness you could want, with the added benefit of all the nutrients your body needs. Try spreading them with organic Greek yogurt and a drizzle of raw honey and almond shavings for a tasty Mediterranean dessert. Tahini paste is an excellent substitute for many baking ingredients such as peanut butter and sweetened thickeners, but it also makes an ideal savory cracker base. This easy recipe combines sesame and wholegrain mustard (with the option of replacing the latter with your seasoning of choice) for a delightfully tangy cracker that’s surprisingly filling thanks to the addition of tahini. Great dipped in hummus and tzatziki sauce, or garnished with an organic olive tapenade. 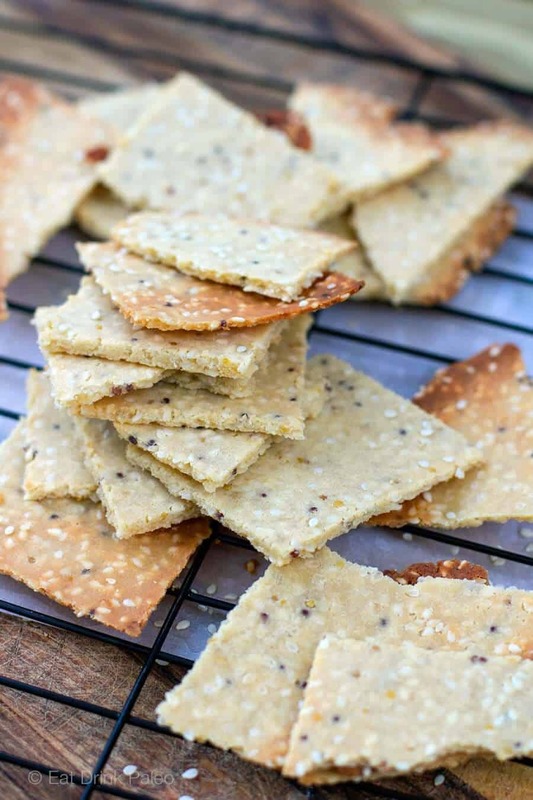 These no-nonsense crackers are a great starting point if you’re new to Paleo cracker recipes. 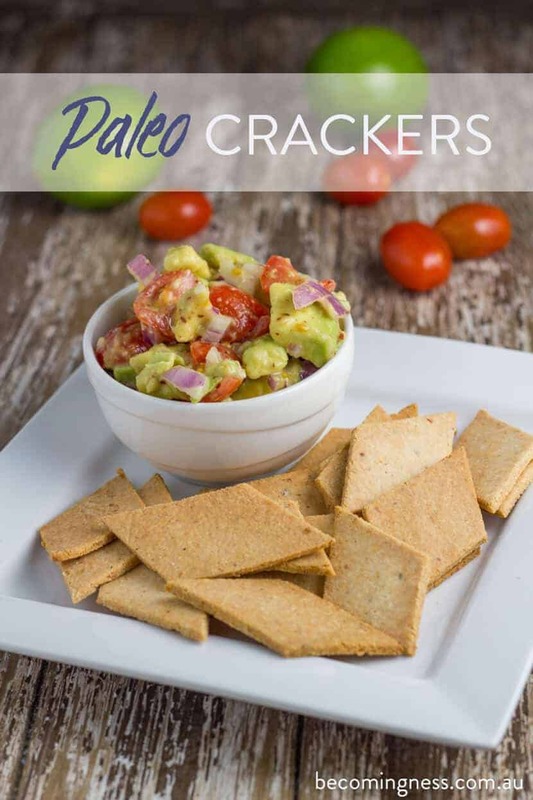 Simple, straightforward ingredients and a pop of cayenne pepper ensure an eye-opening introduction to Paleo snack foods, with these crackers sure to launch a variety of tasty concoctions. 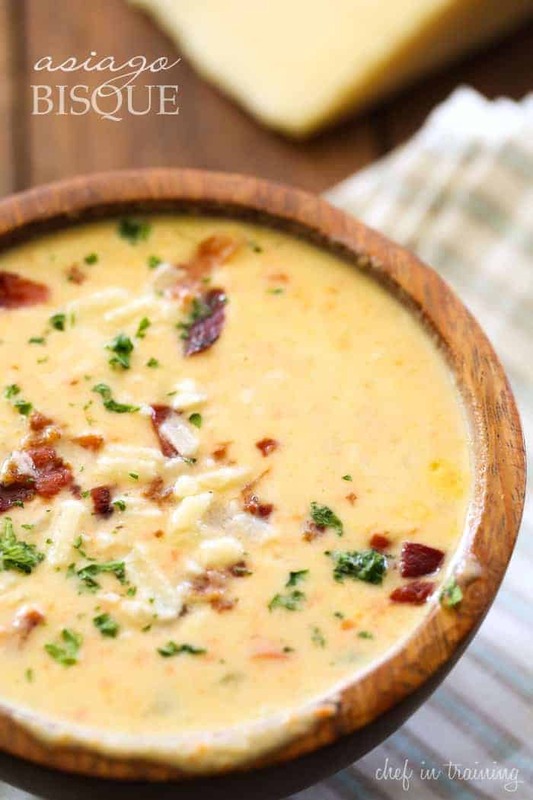 Feel free to play around with additional spices and seasonings, and try combining the crackers with homemade soups, dipping sauces, and salsas. Packed with healthy fats, vitamins, and minerals, cashews are featured in a number of Paleo foods and recipes. Cashew meal lends a bit of sweetness to this Paleo recipe, while garlic, onion, salt and pepper keep them on the savory side. 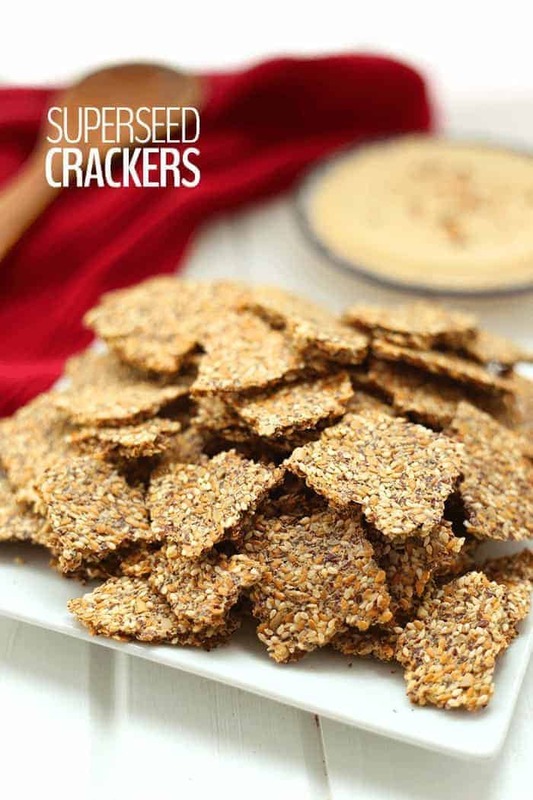 These grain-free crackers are easy to make and boast a nice little dose of cashew goodness. Combine them with both sweet and savory spreads and sauces, as well as curry varieties, for the ultimate pairing. Gluten-free and dairy-free, and naturally sweetened with organic molasses, these goodies are an irresistible cross between ginger snap cookies and graham crackers. 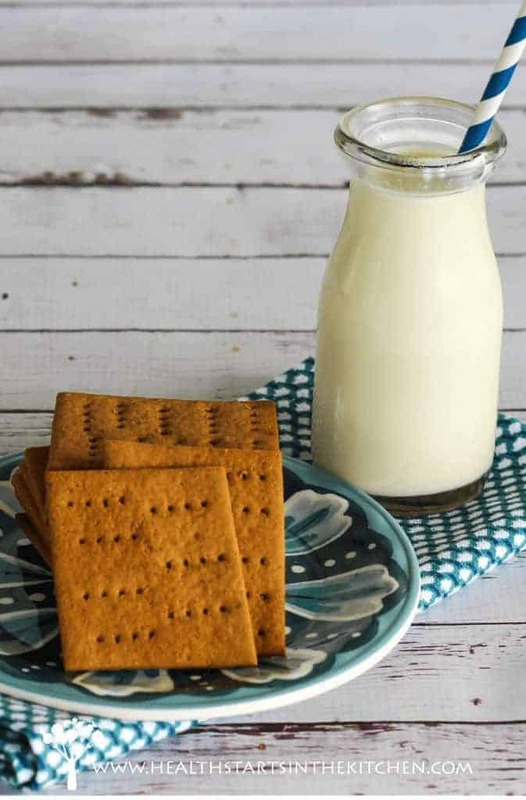 With a hint of cinnamon and vanilla, these graham crackers were made for spreading with almond butter & preserves, or serving up as campfire s’mores. This easy recipe is great for keeping on hand when looking to make a quick graham cracker crust for Paleo-friendly pies and other desserts. Extra virgin olive oil, rosemary, and (optional) parmesan make these an instantly addictive Mediterranean snack treat, with lots of room to add or subtract seasonings according to taste. Though classified as a whole grain food, chia seeds are usually organically grown, boasting non-GMO and gluten-free qualities. 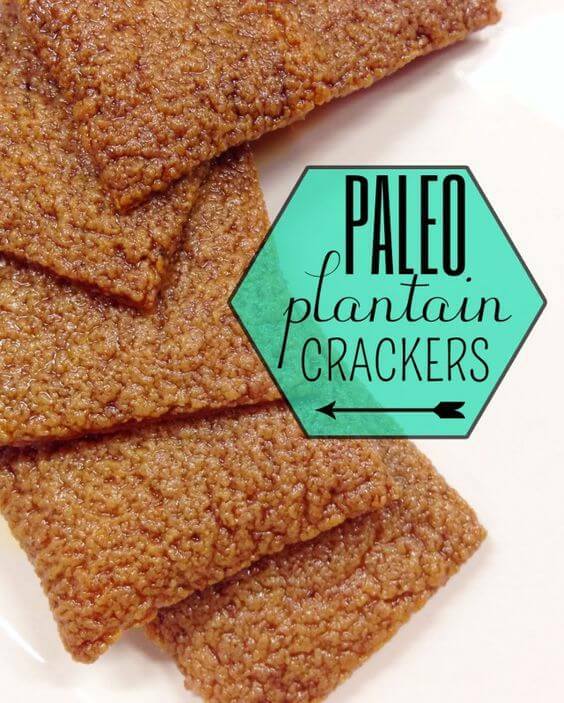 Rich with a plethora of vitamins, minerals, and nutrients, they’re an oft-seen addition to many Paleo cracker recipes. 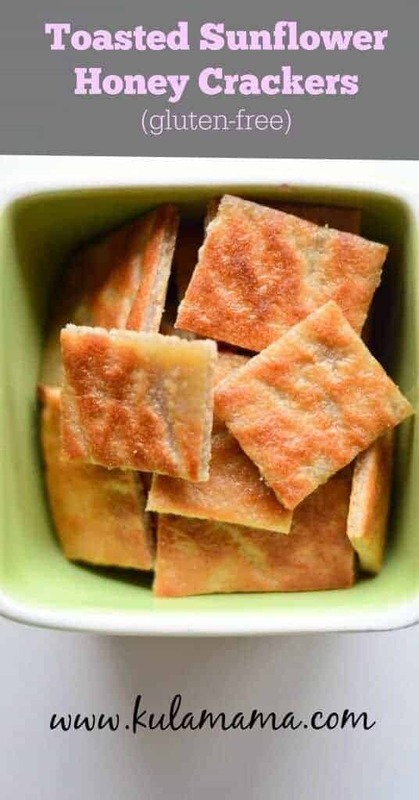 These parmesan crackers are sure to be a welcome addition to any platter of olives, oils, and spreads, and will keep in an airtight container for up to three weeks, making them perfect for last-minute meals and get-togethers. 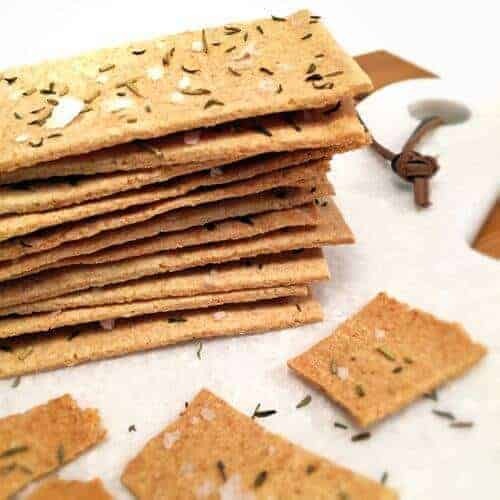 These 4-ingredient, low carb and gluten-free crackers can be whipped up in a jiffy, and pair well with just about anything, from cheese spreads to salsas, as well as sliced meats and vegetables. For the more adventurous, try adding different Caribbean, Asian, and Latin American seasoning combinations and pair with equally inspired dips and dishes. 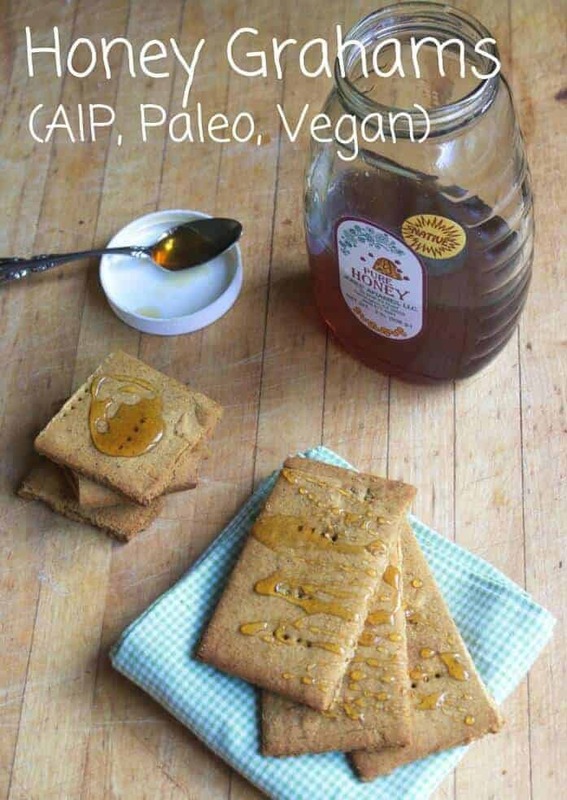 As close to the classic honey graham cracker as you can get, these Paleo graham crackers are a gluten-free way to enjoy a childhood favorite thanks to ingredients such as raw honey and organic vanilla. 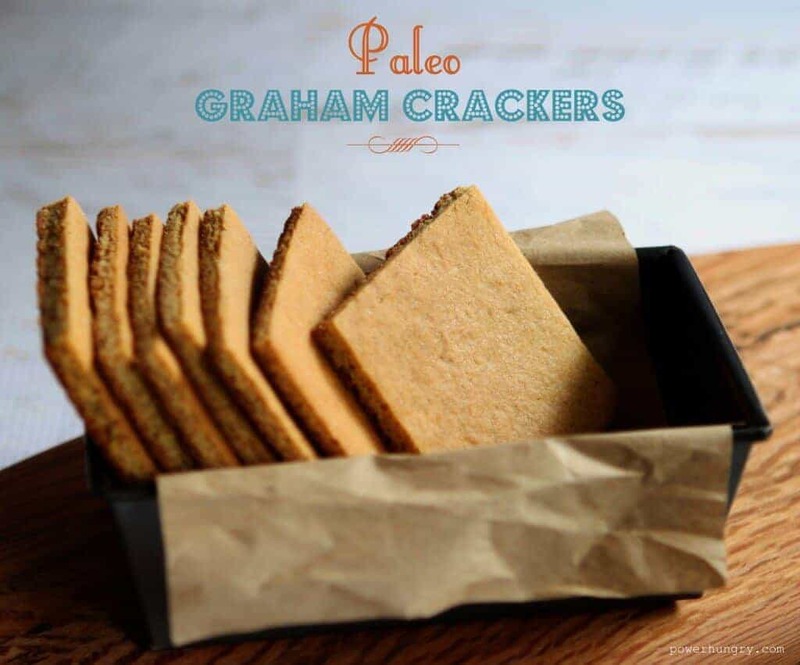 Perfect with a glass of almond milk or cup of coffee, alone or with all the toppings graham crackers were made for, these crackers are sure to find their way on your Paleo roster of favorites. 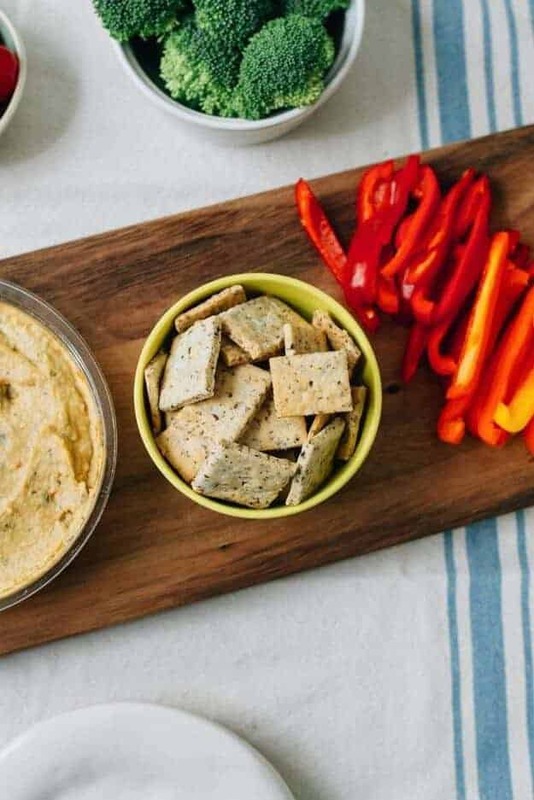 Perfect for those who love a hotter kick in their flavors, these habanero crackers have the added benefit of red bell pepper-derived antioxidants combined with the numerous vitamin, mineral and fiber benefts of cashews, sunflower seeds, and almonds. These crackers can be snacked on alone or dipped into homemade salsas and guacamole, or crumbled over chili stews and taco salads. 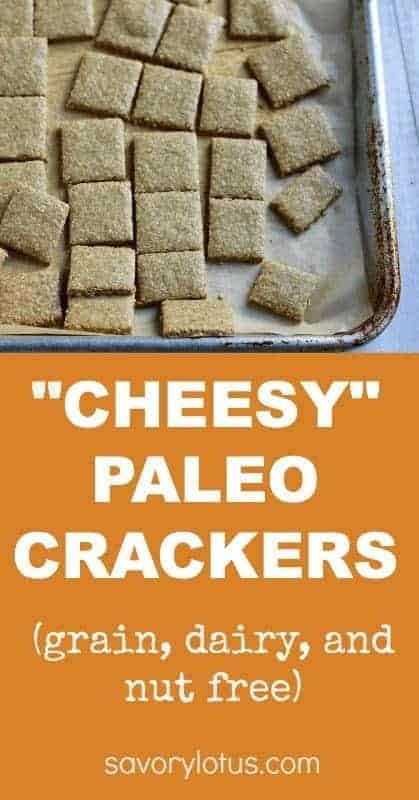 However you choose to chow down, these crackers definitely prove that Paleo food is anything but boring! 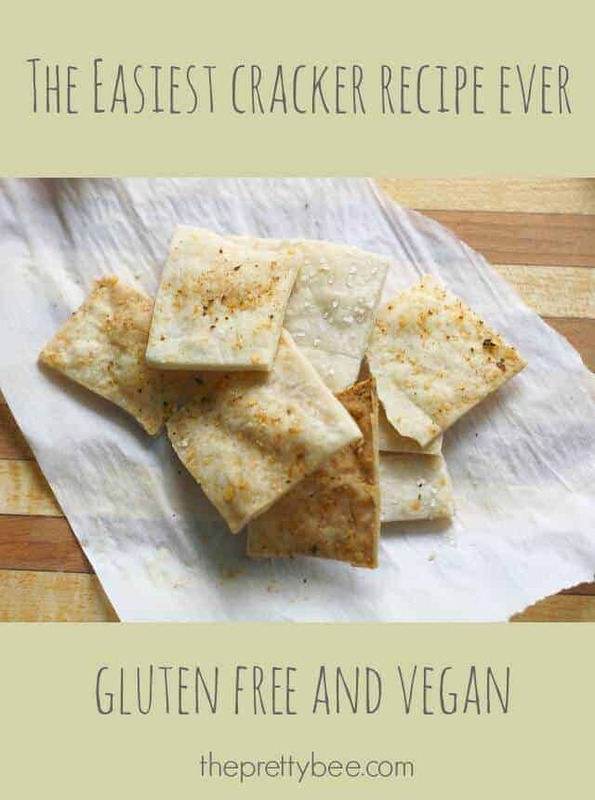 Super easy to prepare, these crispy gluten-free crackers meet all the requirements of low carb, ketogenic, and Paleo diets without sacrificing taste. 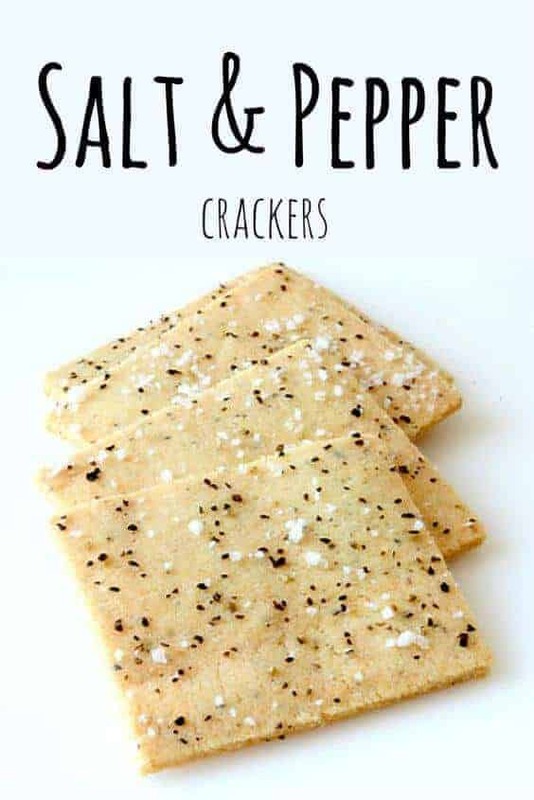 Nutty almonds and sesame seeds keep these crackers on the hearty side, while equal parts salt and pepper make them excellent for noshing on to satisfy snack cravings. These crackers are also great for dipping in tahini sauces or Asian inspired broths. Not only are these crackers 100% vegan, raw, gluten and nut-free, but taste superior to expensive, organic whole food brands. 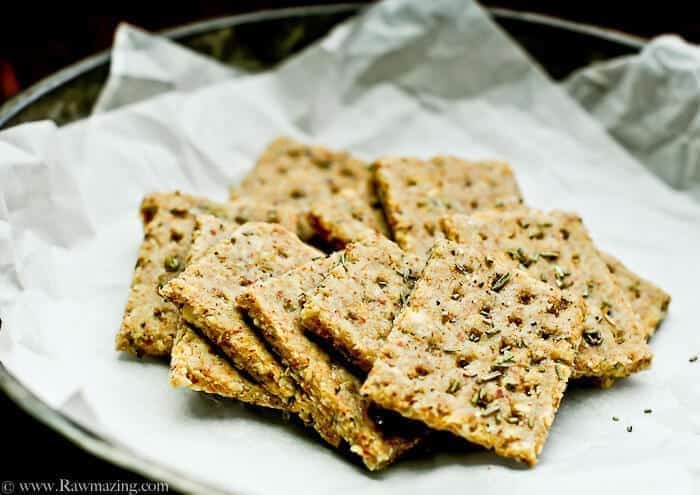 The beauty of seed-based crackers is you can mix up the varieties and pair with your preferred seasonings for a completely unique snack that fits your taste–and budget. For example, chia seeds are great for building up strong bones, while pumpkin seeds offer a hefty energy boost. Sesame seeds contain omega-6 fatty acids that are known to control harmful cholesterol, and flax is a widely-revered cancer inhibitor. 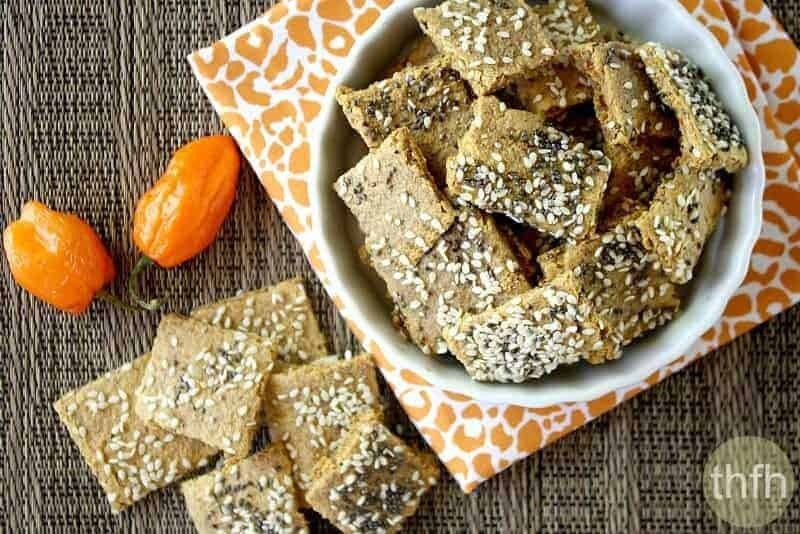 Whatever your health and wellness needs, you can craft your own unique Paleo power cracker. Flatbread is, quite simply, one of the most delicious things to ever happen to human cuisine. Rolled up into gyro wraps or torn apart and dipped into pretty much any sauce, it’s hard to imagine a homemade dish that can’t be improved by a good flatbread. And fortunately for Paleo diet followers, this rosemary garlic flatbread meets all the criteria and tastes divine. Gluten-free and filled with generous amounts of garlic and onion, this flatbread can also double as a delicious Paleo pizza crust. A bold statement perhaps, but these homemade crackers are bulletproof in meeting nearly all nutrition-specific requirements. 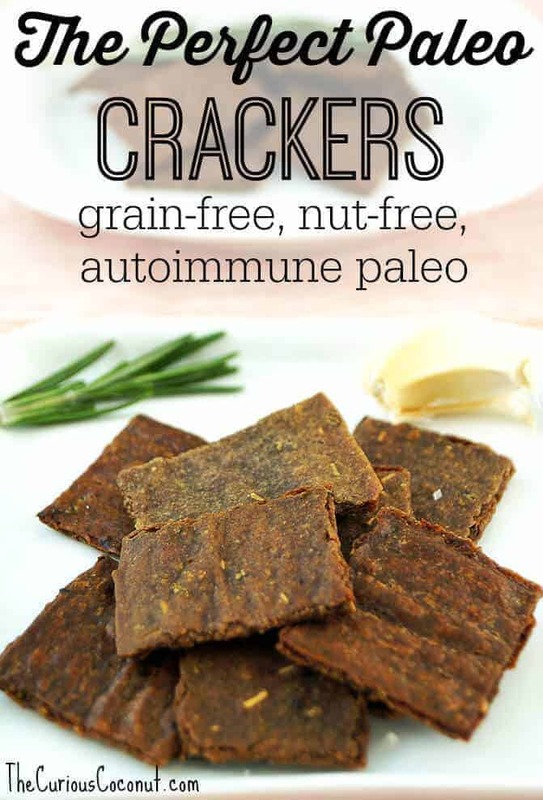 Gluten-free, grain-free, and nut-free, these crackers were designed with the autoimmune Paleo diet in mind. Plantain flour and coconut oil lend a pleasantly tropical sweetness, while garlic, rosemary, and salt make them ideal for savory snacking any time. You can combine these simple crackers with any or all of your favorite soups, spreads, and savory dishes, or crumble over salads for added crunchiness. Potassium-rich plantains are a great substitute for white and wheat flours, and give an added energy boost where most flours fill you up but send you crashing an hour later. This easy recipe only requires pureed plantains, coconut oil, and salt, with the end result a crunchy, can’t-eat-just-one cracker that’s great for dairy-free dips, yogurts, and tzatziki sauces. 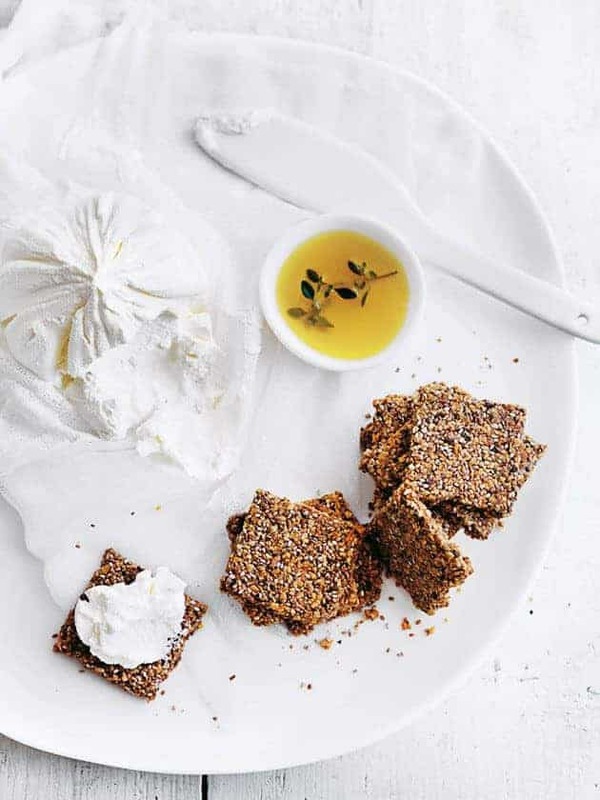 This no-nonsense grain-free cracker pairs well with various cheeses and dips, with a suggested assortment of seeds and spices such as chia seeds, sesame seeds, sea salt, black pepper, fennel seeds, dried oregano, and sumac upping the healthy flavor factor. Best of all these sunflower crackers are 100% dairy-free, gluten-free, grain-free, and soy-free, and are furthermore suitable for all Paleo and vegan dietary plans. Ultimately, the Paleo food philosophy is all about getting back to the basics of our ancestors. By eliminating inorganic, processed foods and artificial additives, your body can burn the purest kind of fuel and fulfill the utmost of its potential. Followers of the Paleo diet almost instantly report an overall feeling of improvement in their health and well-being, along with faster metabolic calorie and fat burning and higher physical performance. Fruits, vegetables, healthy fats, and lean proteins may form the foundation of the Paleo kitchen, but from there the possibilities are endless. The sadly widespread misconception that Paleo eating is bare-bones at best, with limited allowance for spicing things up or enjoying formerly savored snacks, simply isn’t true. The 50 Paleo cracker recipes listed above are just a sampling of the countless ways you can shake things up without breaking any dietary stipulations. Seeds, nuts, healthy oils like olive and coconut, along with an assortment of seasonings from around the world make up the majority of ingredients featured in many Paleo snack recipes, and many people are often amazed at how far those basic tools can stretch. The Paleo way seeks to improve the quality of your food, and by making a few simple adjustments to your own pantry and eating habits you’ll wonder why you didn’t snack this way sooner.